Top Reasons to get certified from Autodesk, USA. Modern industry is rife with competition. College education accords their most devoted and intelligent students with knowledge and professional conduct. Qualified, motivated and hard working professionals are retained as most attractive in the eyes of an employer since their hard work helps employers prosper and gain reputation in their industry. Students and professionals that wish to succeed and prosper in their lives utilise every opportunity to achieve their goals. Top 10 Reasons to get certified from Autodesk, USA. 1. Skill recognized in Industries. Autodesk software provides a unique opportunity for individuals to shine and build a reputation for their verified skills and expertise. Certification in Autodesk equips individual with essential knowledge and skills to successfully fill the requirements of any company. 2. Expertise in the latest Autodesk technology. Autodesk is perennially introducing improvements in its software. Expertise in the latest improved software helps individuals to meet current challenges of their ever changing industry. Autodesk Certification in the most up-to-date software also helps showcase that the student or professional is equipped to deal with current reigning problem areas effectively. 3. Performance improvement and value-addition to companies. The study and course of the certification focuses on performance improvement by not only fortifying your current capabilities but also providing new skills through their easy-to-learn course material. 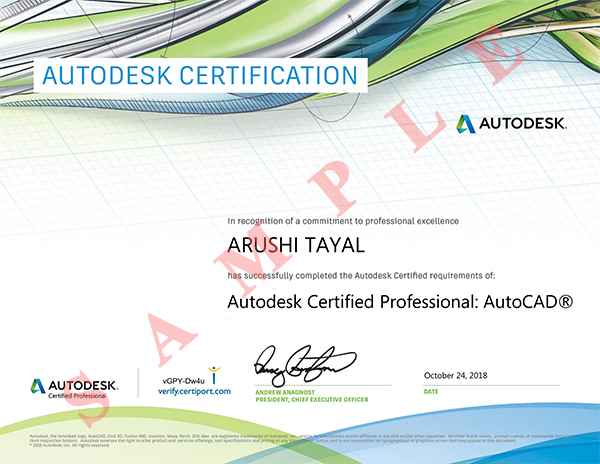 Autodesk certification also adds value to individual since the knowledge, skills, projects and assignments of the course are industry significant and are also relevant to any employer. Learning a useful skill set from certification helps an individual gain confidence since they learn skill knowledge which adds to their productivity and helps them see themselves as a skilled individual who is more than just a job or a college degree holder. Securing Autodesk certification can bring appreciation and recognition from peers. Professionals derive the advantageous opportunity to be considered for promotion or career advancements in light of a verified skill gained through certification. Autodesk certification adds credibility to one’s commitment to their job and their industry. Since Autodesk Certification is recognised worldwide, the credential and skills learnt under the course can be carried with the individual to almost everywhere in the world. listing in Autodesk’s database of certified professionals around the world. Softwares from Autodesk are used by more than 10 million professionals in 185 countries. Autodesk products have helped save time and money, increased production, facilitated valuable collaborations and effectively changed the way ideas are perceived. Autodesk is a world leader in 3D design, engineering and entertainment softwares. It assists design professionals to transform challenges into opportunities, design with best practices and gain competitive edge. Autodesk, its partners and its Certification Centres offer a variety of solutions to help prepare for the certification. These include road maps for exam preparation, assessment tests, Autodesk Official Training Guides (AOTG) and courses at Autodesk Authorized Training Centres (ATCs). These certification solutions are available worldwide. Preferred course out of these is the associate exam. Autodesk offers performance-based professional-level tests. These tests use online Autodesk software application to engage in questions regarding design problems and solutions and are recognized as the better way to certify proficiency in the course.